Frisco, Texas is a city in the Dallas-Fort Worth metroplex, located about 40 km (24.9 mi) northeast of the Dallas/Fort Worth International Airport. Founded in 1860 along the Shawnee Trail, the town has become a bedroom community for workers in Dallas-Fort Worth. 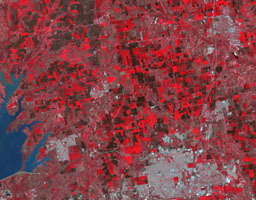 The city saw explosive growth between April 9, 1984 when the Landsat TM image was acquired, and April 15, 2018 when the ASTER image was acquired. Population grew from 4,500 to 174,000. The images cover an area of 27 by 34.5 km (16.7 by 21.4 mi), and are located at 33.1 degrees north, 96.8 degrees west.